The foundation stone will be laid out for the first ever traditional Hindu Mandir (temple) in Abu Dhabi this weekend, on April 20. The Shilanyas Vidhi (foundation stone laying ceremony) will be attended by Foreign Minister of UAE, HH Sheikh Abdullah Bin Zayed Al Nahyan, UAE Minister of Tolerance, HE Sheikh Nahayan Mabarak Al Nahayan, and Indian envoy to UAE, Navdeep Suri. His Holiness Mahant Swami Maharaj, the spiritual head of Bochasanwasi Akshar Purushottam Sanstha (BAPS), the organisation who is building the temple, will be presiding over the event, along with many sadhus (priests) coming from India. During the two-hour ceremony, ancient Vedic verses will be chanted and prayers will be offered by the priests to sanctify the pink sandstone that will form the base of the temple. The ceremony will also be attended by a thousand worshippers from the UAE and the Middle East, and will mark the beginning of the building of the Mandhir. It’s expected to be completed in 2020. It will be built on 55,000 square metres of land that was donated by HH Sheikh Mohamed bin Zayed Al Nahyan, Crown Prince of Abu Dhabi, to Indian Prime Minister Narendra Modi during his visit in 2016. An additional 55,000 square metres was also donated by the Abu Dhabi government for parking facilities for visitors. The Mandir will be known as BAPS Shri Swaminarayan Mandir of Abu Dhabi and will be located in Abu Mureikha, Abu Dhabi off the Dubai-Abu Dhabi highway. 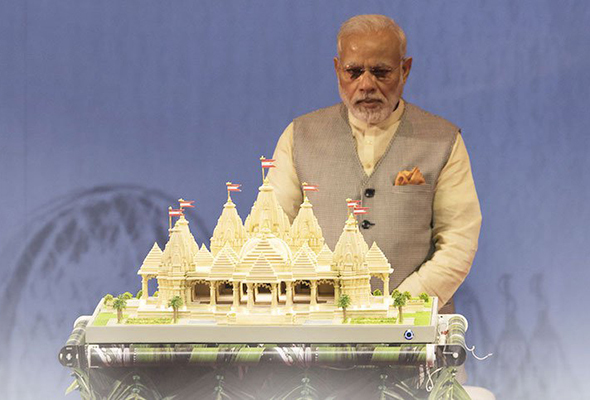 The design of the temple was also revealed during Modi’s visit but at that point, was not yet finalized. 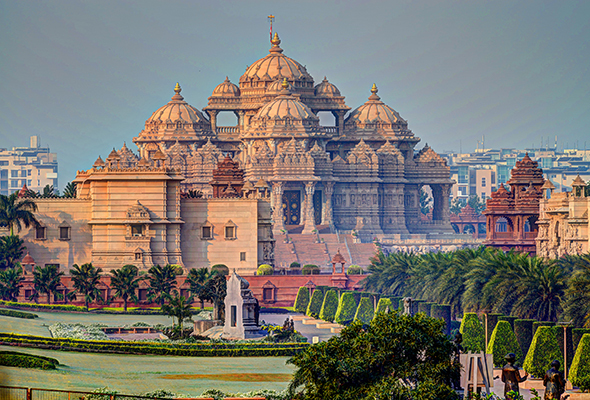 However, it will take inspirations from several Hindu temples such as the Akshardham temple in New Delhi, India, pictured above. The material for the stones will be pink sandstone that is found from Rajasthan in India. The stone is able to withstand high temperatures which will make it perfect for the summer weather here in Abu Dhabi where temperatures can reach as high as 50 degrees Celcius. The structure will feature seven spires (one to represent each of the seven emirates) and five ornate domes, and artisans have already begun sculpting the stones in India. Once ready and numbered, thousands of such stone pieces will be shipped to the UAE and assembled on site like a giant 3D jigsaw puzzle. The cost of all of this is estimated to be between Dhs400m and Dhs450m. The temple will not just be a place of worship for the Hindu community who visit, but it will also include prayer halls, a visitors’ centre, exhibitions, learning areas, sports area for children, thematic gardens, water features, a food court, a book shop, and gift shop. While the temple is greatly welcomed by the 3.3 million Indians (50 per cent of which are estimated to be Hindus) who call the UAE home, it will also be open its door to people of other faiths.